Trash to treasure — kind of. 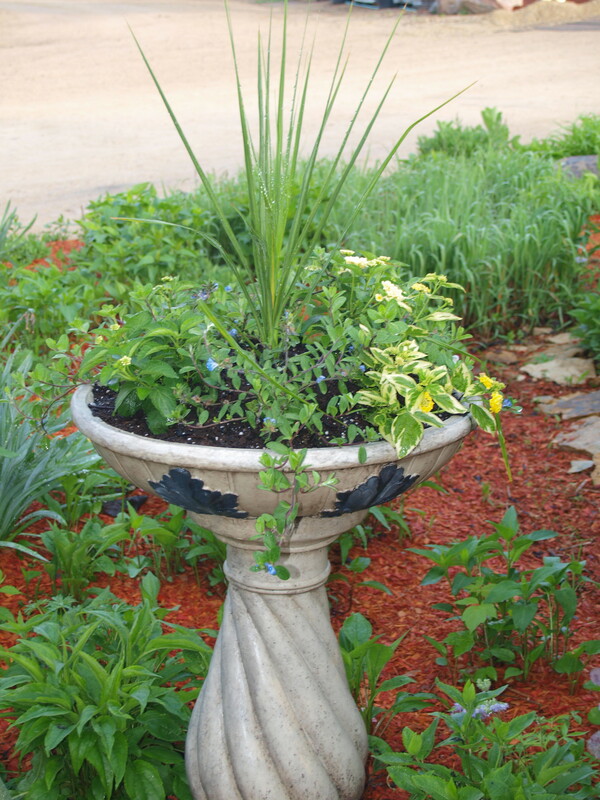 Heidi Brosseau – of our retail staff – has such a creative mind that she sees a container garden in almost anything. Pictured here are all examples of her work! 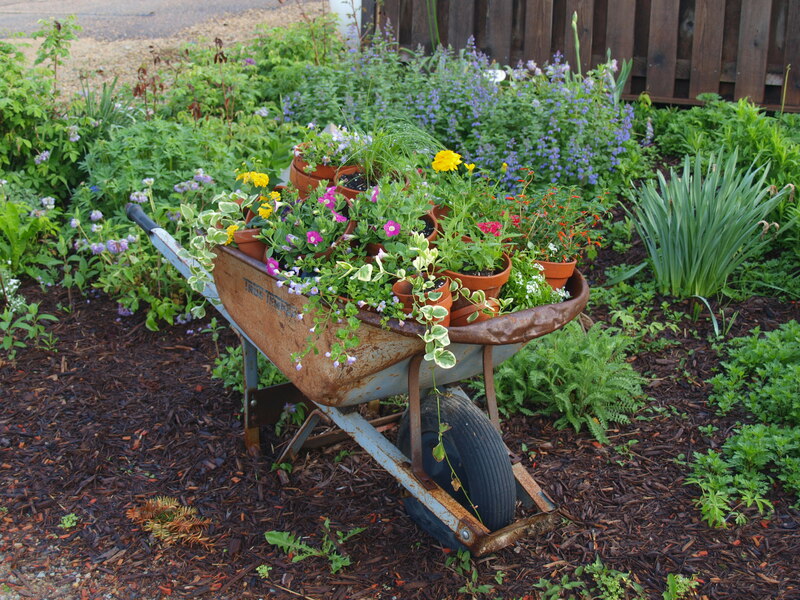 We have put a couple of old wheelbarrows to use as container gardens. An old plastic birdbath developed a hole and wouldn’t hold water – so instead of throwing it away – it now adorns the butterfly garden as a container garden. 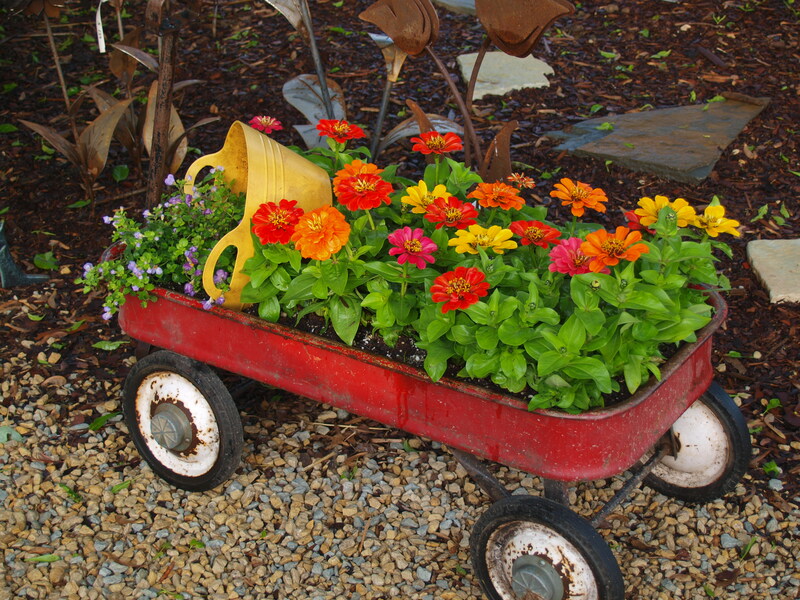 One of our landscape customers sent back an old red wagon with the guys and Heidi transformed it into a container garden. 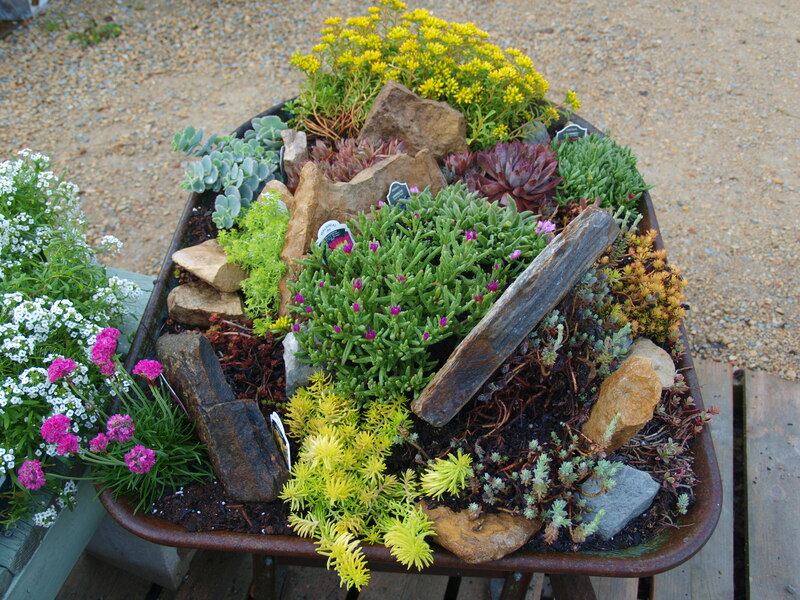 A succulent perennial garden fills one of the wheelbarrows! Heidi created it three years ago and each fall, it gets moved into one of the hoop houses for the winter and with a little “perennial clean-up” in the spring, we bring it back out and it’s beautiful once again. Heidi added a few pieces of leftover limestone as natural accents. 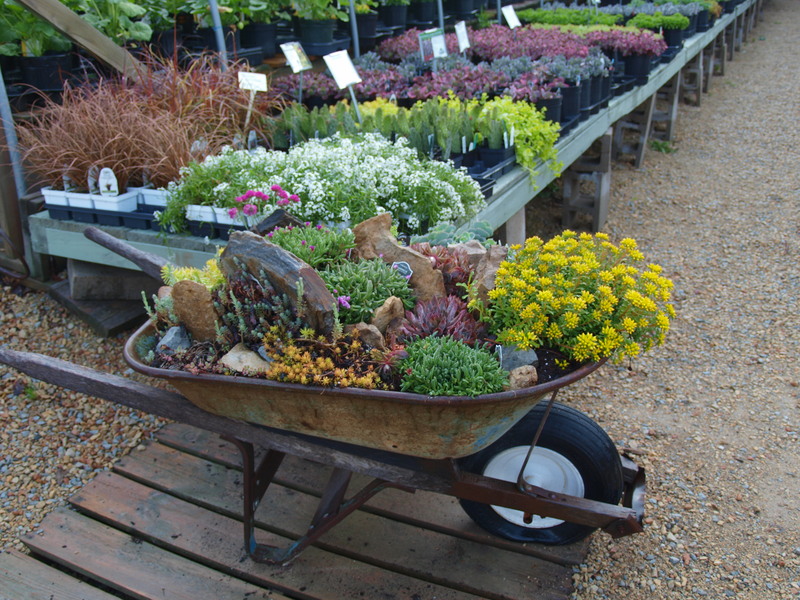 Last weekend, Heidi took the other wheelbarrow and I thought she was cleaning up the potting area. Wrong. 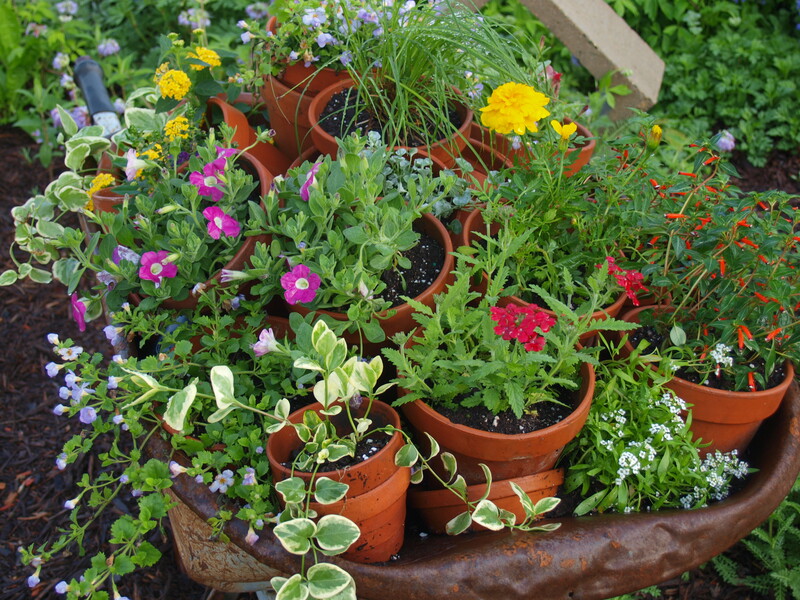 She piled all kinds of old terra cotta pots and placed them in the wheelbarrow – some stacked inside the other, some going this way and that way – and all of a sudden – it is now one the most clever container gardens she has come up with. 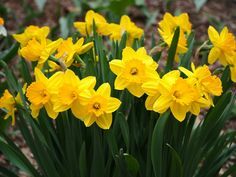 It now features a sunny annual container garden. 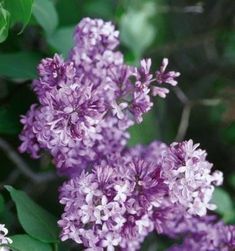 If an area at your home needs an accent or a “pop of color” – think outside the box – look in the garage or shed and see what you have that could now become a container garden! Thank you Heidi for all of your creative ideas!